We think sharing on the web can be even better -- that people might share more recommendations, more often, if they knew their advice would be used to help their friends and contacts right when they’re searching for relevant topics on Google. The +1 button is an easy way for users to recommend your content right from the search results pages. The +1 button doesn’t affect the AdSense ad units on your site, but it can improve the way your pages appear in Google search. +1 is a simple idea. Let’s use Brian as an example. When Brian signs in to his Google Account and sees your site in the organic search results on Google (or search ads if you’re using AdWords), he can +1 it and recommend your page to the world. We expect that personalized annotations will help sites stand out by helping users see when your Google search results are personally relevant to them. As a result, +1’s could increase both your quality and quantity of Google search traffic. But the +1 button isn’t just for search results. We’re working on a +1 button that you can put on your pages too, making it easy for people to recommend your content on Google search without leaving your site. If you want to be notified when the +1 button is available for your site, you can sign up for email updates at our +1 webmaster site. Over the coming weeks, we’ll add +1 buttons to search results and ads on Google.com. We’ll also start to look at +1’s as one of the many signals we use to determine a page’s relevance and ranking. For +1's, as with any new ranking signal, we'll be starting carefully and learning how those signals affect search quality over time. At first the +1 button will appear for English searches only on Google.com, but we’re working to add more languages in the future. We’re excited about using +1’s to make search more personal, relevant and compelling. We hope you’re excited too! If you have questions about the +1 button and how it affects search on Google.com, you can check the Google Webmaster Central Help Center. Most successful AdSense publishers have something in common: users who are passionate about their content. Today we’re making it easy for the users who love your content to recommend it to their friends and contacts with the +1 button. In addition to great targeting, Custom Search Ads are designed to fit your existing search results’ look and feel. Instead of pre-defined sizes, you can specify the precise width of each ad unit along with the number of individual ads to display, the ad layout, font size, font face, and much more. You can take a look at how some of our first publishers are using these today on LemonFree.com or eCrater.com. With Custom Search Ads, we can rapidly develop and launch new search ad formats and extensions without requiring you to update your search code. For example, on Google’s results pages we’ve been busy testing new search ad extensions to provide users with information like locations, product images, page links, and merchant information. Two of these new formats are available today in Custom Search Ads: Ad Sitelinks and Seller Ratings. Ad Sitelinks extend the value of ads by showcasing up to 4 additional links to specific, relevant content within an advertiser’s site. Seller ratings add star ratings below a merchant’s ad aggregated from review sites across the web. These help highlight ads for merchants highly recommended by online shoppers. As new formats are developed in the future, we’ll continue to bring them to Custom Search Ads so you benefit automatically. To get started with Custom Search Ads, sign up today! We’re currently only able to accept and support a limited number of publishers, but we’re excited to review your application and expand this program in the future. Here at Google we’ve put a lot of work into displaying the best ads on search results pages, and we want your results pages to benefit too. If your site is search-focused -- for example, if your users are looking for jobs, travel, products, or local businesses -- the ads you display can now be targeted to the same search query you use to return results. This means more relevant ads for users, more revenue for publishers, and better value to advertisers. Today we’re excited to share our latest AdSense for search product: Custom Search Ads. and how it's influenced by what users do when they come to your site. We want to take this conversation a step further today, and discuss some strategies that can potentially increase the cost per click (CPC) of your ad units. Enable all of your ad units to show both text and image/rich media ads. By increasing the number of advertisers competing for your ad units, the ad auction will make sure that the highest paying ad will be shown. Learn more from one of our publishers who made this change, and edit all your units in bulk with the new AdSense interface. Keep your filter list small so you don’t lower your revenue potential by blocking the highest-paying ads. Watch this video to better understand the ad auction and how to enable the most competition for your ad space. Increase the number of ads competing for your site by setting up your custom channels for placement targeting. Read this post for more details and instructions on how to set these up. The top-paying ads will be shown in the ad unit that appears first in your HTML code. To take advantage of this, you will need to understand which of your ad units has the highest clickthrough rate (CTR) by using custom channels. Then, you can easily change the code of your website to make sure that your top performing unit is the one with the highest-bidding ads. Some publishers believe that by writing about high paying keywords they will be able to improve the earnings on their site. This is not a practice that we encourage. In fact, we always recommend to write about subjects that you know well and that you are passionate about so you can continue to create the compelling, original content that attracts visitors to your site. Don't use scraped content. It’s a violation of our policies. Don’t create multiple accounts. Publishers are not permitted to maintain multiple AdSense accounts under the same payee name, and having the ad code of different accounts on the same website will not affect your CPC in any way. Finally, don’t try to manipulate the standard behavior, targeting, or delivery of ads in any way that is not explicitly permitted by Google. In case you have any doubt, read the AdSense program policies. We hope this helps you optimize your AdSense implementation and maximize your CPC. Leave us a comment with the results! In previous blog posts we’ve explained what RPM is and how it's influenced by what users do when they come to your site. We want to take this conversation a step further today, and discuss some strategies that can potentially increase the cost per click (CPC) of your ad units. come within the Self-Regulatory Program (until then, these sites will show the existing “i” icon and “Ads by Google” label). This will be the single most widespread rollout of the "AdChoices" label to date, and we're encouraged that others in the industry are similarly adopting it. We’re also looking at ways to increase transparency and control in other languages and countries. In the meantime, those languages and countries will continue to see the “i” and “Ads by Google” notice. Just like before, users who click on the "AdChoices" label will be taken to a page where they can learn more about online advertising and the ads they've just seen. This page will also provide a link to the Ads Preferences Manager, where users can control the types of interest-based ads they see. Our tests of this new icon and label showed that they should not have any effect on ad performance. We think this rollout will help users better understand the ads they're seeing, and we look forward to seeing widespread adoption of this label throughout the industry. 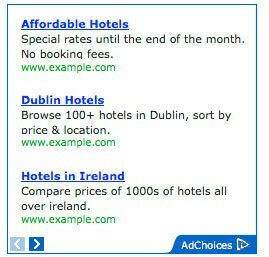 You've probably noticed that AdWords ads appearing on your site have a special "i" icon that expands to an "Ads by Google" label in the bottom corner of the ad. Users who click this label are taken to a page where they learn more about online advertising and the ads they've seen. Giving users clear notice about the ads they see is a high priority for Google and for many in the online advertising industry at large. We'll soon start to change our in-ads notice icon to a new icon that expands to an "AdChoices" label. These notifications were developed by the online advertising industry’s Self-Regulatory Program for Online Behavioral Advertising to more proactively give users notice and choice about the ads they see. With the change from our "i" icon and "Ads by Google" label to these new notifications, we hope to show our support for this cross-industry initiative, and to increase our users' understanding about ad choices through adoption of an icon they'll see on ads across the web. In a few weeks, we'll begin to show the new icon and label on most ad formats across the majority of English-language sites. Over time, we’ll expand the notice to ensure that all English-language publisher sites in the Google Display Network come within the Self-Regulatory Program (until then, these sites will show the existing “i” icon and “Ads by Google” label). This will be the single most widespread rollout of the "AdChoices" label to date, and we're encouraged that others in the industry are similarly adopting it. We’re also looking at ways to increase transparency and control in other languages and countries. In the meantime, those languages and countries will continue to see the “i” and “Ads by Google” notice. This Sunday, our engineers will be performing routine site maintenance from 3am to 7am PDT. You may be unable to log in to your AdSense account during this time and some features may be temporarily unavailable during the maintenance. We'll continue serving ads to your pages and tracking your clicks, impressions, and earnings as usual. Your ad targeting won't be affected. A big St Patty's cheers from everyone on the Dublin AdSense team!
. Your site is no exception. And today, as part of this vision, we’re pleased to announce a major boost in speed for AdSense publishers worldwide. AdSense ads, like any element on a webpage, usually contribute to the time the page takes to load. Last year, we ran tests that showed AdSense adding 12% on average to the time it took to load various pages from top web sites, so we set out to make this better. We’ve now developed a new ads delivery technique to improve the speed of websites that display AdSense ads, so that it doesn’t slow down your page content. We’re very happy to announce that we’ve eliminated this slowdown for the majority of websites and for a number of browsers, and are seeing pages load as much as a second faster than before. The best part is, you don’t need to make any changes to your code or account — the faster load time has kicked into gear for everyone automatically, so your visitors will experience a noticeable improvement in the speed of your webpages! At this time, we're deploying globally for users of Google Chrome, Mozilla Firefox and Microsoft Internet Explorer 8 and will be expanding the list of browsers that benefit from this speed-up soon. And it doesn’t stop here, as we’ll keep working to make things even faster. Continue to grow your site and AdSense inventory. We’ll be sure to keep up. At Google, we spend a lot of time working to make the web faster. Your site is no exception. 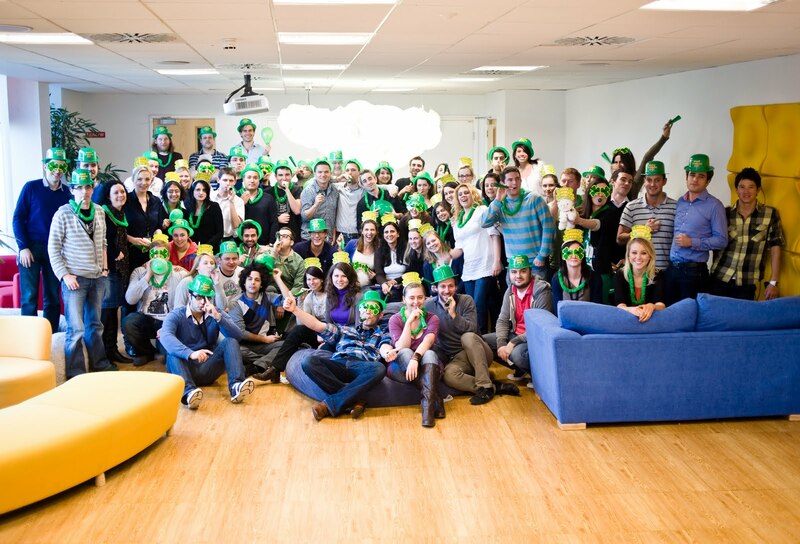 And today, as part of this vision, we’re pleased to announce a major boost in speed for AdSense publishers worldwide. UpTake uses the new AdSense interface to perform 10 times more analysis in the same amount of time. UpTake.com is a search engine designed to take the time and guesswork out of the travel decision process by organizing, filtering, and tailoring recommendations on destinations, hotels, restaurants, and attractions from thousands of travel websites to individual consumer needs. UpTake’s Director of Online Marketing, Brian Piepgrass, recently shared the site’s story and gave us some tips on how using the new interface has helped the UpTake team save time managing their AdSense performance. Inside AdSense: How did your site come about? UpTake: We wanted to create a new kind of website for helping travelers find information they need, and take a lot less time doing it. We’ve become one of the web’s largest independent travel research sites, averaging 3 million unique users each month. Today, our vision is rapidly expanding to include family travel, international travel as well as pre-trip planning. UpTake: The new AdSense interface has been a key time-saver. It used to take a half-hour to pull the kind of report that now we can pull in a matter of 30 seconds. We feel way more in touch with how things are trending. If revenue goes down we can much more easily figure out why and where and then go fix it. One of our favorite features is the ability to take out-of-the-box reports and tailor them specifically to our customers. We can just click on the name of a report and update to today. The system is also smart enough to know we want to see what happened last month, and we can save 20-30 reports. Uptake: We can do 10 times more analysis than we ever used to be able to do in the same amount of time.
. We’ve heard some inspirational stories from publishers who are donating their AdSense revenue to help and we’ve heard from many of you wondering how you can also donate AdSense earnings to help those affected by the earthquake. Currently, the fastest way to contribute is to donate directly via our crisis response page. All donations will go to the Japanese Red Cross Society and will be used directly to support to those affected by the earthquake. We're working to roll out a way to donate earnings directly from your AdSense account. Please check back here for updated information. If you’re looking for additional resources, we’ve also launched the Google Person Finder in Japanese, Chinese and English as a tool to help locate missing people, as well as sites in Japanese and English to provide updates on the affected area. You may have already seen some of Google’s various efforts to help Japan in the wake of last week’s 8.9 earthquake. We’ve heard some inspirational stories from publishers who are donating their AdSense revenue to help and we’ve heard from many of you wondering how you can also donate AdSense earnings to help those affected by the earthquake. , we introduced a unique chance for all AdSense publishers to access affiliate exclusive opportunities from Google Affiliate Network advertisers. We are happy to announce that the Affiliate Exclusive Opportunity program has been extended into 2011. How do I promote these on my site? To promote any of these exclusive opportunities, you need to be an approved publisher in Google Affiliate Network. Apply for Google Affiliate Network with your AdSense Publisher ID (or sign in if you are already a Google Affiliate Network publisher). Once approved, review offers and click the "Apply Now" link for every one that you wish to promote. Tracking links will be available in your Google Affiliate Network account by viewing the “Announcements” section of your Home tab. You can also search for “March Affiliate Exclusive Offer” links in the Links section on March 25. When can I post these on my site? The full set will not be live or valid until March 25, and all will expire at midnight. You may not post any of these exclusives until March 25. To learn more about Google Affiliate Network and other affiliate exclusive opportunities please visit this blog post. Last holiday season, we introduced a unique chance for all AdSense publishers to access affiliate exclusive opportunities from Google Affiliate Network advertisers. We are happy to announce that the Affiliate Exclusive Opportunity program has been extended into 2011. Over the past three weeks, we’ve had the opportunity to meet a bunch of you in person. Through events in San Francisco, Mountain View, Charlotte and Atlanta, we’ve been able to see and optimize some incredible sites, as well as learn directly from you how we can continue to improve your experience with AdSense. 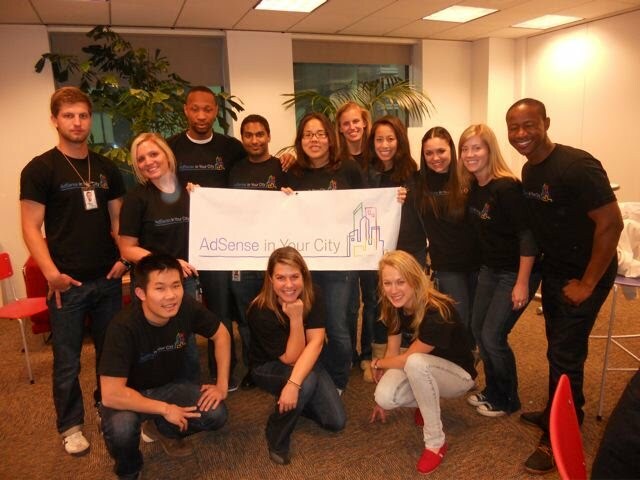 In San Francisco, around 50 publishers joined us in our office to network with one another, work with our optimization specialists, and chat with members of our Policy team for our first AdSense in Your City event of 2011. Since San Francisco is also our city, it was great to meet some local publishers, and watch some business connections form over coffee and snacks in our downtown office. Mountain View welcomed around 20 new publishers to the Google campus so we could learn more about their experience getting started with AdSense. After discussing some great optimization tips as a group, we got a lot of invaluable feedback over lunch that will enable us to improve the newbie experience for the next generation of AdSensers. Deep diving into our help resources, the new AdSense interface, and our interactive learning materials, we got a lot of suggestions we can act on to improve the way we communicate and teach new publishers to set up and optimize their AdSense implementation. We’d love to hear more ideas about how we can make your first weeks as a publisher better, so feel free to leave us a comment here or join the conversation in our forum. We just got back to sunny California after two quick days meeting publishers down South. Hosting optimization office hours at a funky Charlotte, NC coffee shop and then jetting off to meet more publishers in our Atlanta office the following day, we covered a lot of ground in an area of the country booming with awesome websites, interesting people, tasty food, and vibrant culture. Two days wasn’t nearly enough time for us to soak it all in, but we were able to leave having provided some great optimization tips to an area of the country that we don’t often get to see in person. And the journey doesn’t stop here -- we’re planning to visit more cities in 2011, so leave us a comment with where you think we should go next. We hope to see you in your city soon! You might have read in a previous AdSense blog post that opting in to both text and image ads increases the pool of advertisers bidding for your site inventory -- which can in turn increase the amount of revenue you make from AdSense. In the past, changing all your ad units to accept both text and image ads might have taken a lot of time. But now, the new interface allows you to easily find and edit all or some of your ad units with just a few clicks. Simply go to the 'My ads' tab in the new interface and under 'Content,' choose the 'Ad units' page. Using the checkboxes, select the ad units you’d like to edit, or simply select the checkbox at the top of the list to select all of your ad units. Using the 'Actions' dropdown, select 'Edit ad type.' Choose 'Text & image/rich media ads' and then click 'apply ad type.' Now any ad units that can be opted into both text and image will have this set as their ad type. We recommend opting your ad units into both text and image to increase auction pressure, ensuring you will get the highest RPM possible. Keep in mind that some units such as link units and certain ad sizes cannot contain image ads, so you will not be able to modify these ad types. Just make sure you opt in to the new AdSense interface on your desktop, and then try it out! And if you prefer to use the usual interface on your mobile device, you can always switch to the desktop version (and back) through a link at the bottom of the screen. Keep in mind the mobile interface is still in beta, so stay tuned for more features coming soon. Want to discuss the new mobile interface with other publishers or give us your feedback? Join the conversation in our forum here. Today, we're happy to announce a new beta AdSense interface optimized for mobile devices. Now, when you visit www.google.com/adsense on your mobile browser, instead of the usual "desktop" AdSense, you'll be greeted by a simpler and faster version of AdSense. We built the AdSense mobile interface to give you quick access to the essentials in your account. You can easily check your earnings, get important alerts, and view reports (without the need for Flash) on your phone. This week, we would like to highlight the new inventory management features in the new AdSense interface that let you easily search for specific channels, and see all associated ad units in a single click. To try this feature, navigate to the My ads tab. In the sidebar under the 'Content' heading, choose ‘Ad units.’ Next, open the 'Advanced filters' section. If you type in the name of the channel you want to check out, you can hover over it and see the associated ad units highlighted in yellow. You can also click on the channel name to filter down the ad unit list just to the ad units tracked by that particular channel. If you would like to edit the ad units associated with the channel or any other channel information, visit the 'Custom channels' page for the product. The solution is AdSense for search. This free, easy to implement product lets you place a Google search box on your website. It provides an additional layer of interactivity for your users, while helping you generate additional earnings from ads on the customizable search results page. Site search: Allow users to search directly within your site to find the information they’re looking for without leaving your site. Vertical search: Allow your users to search across multiple sites you select, including related sites you think users might find relevant or a network of sites that you own. Keywords: You can use keywords to make search results more relevant to your audience and your site content. For instance, if you own a website about Pilates, you can enter keywords such as “exercise,” “fitness,” “meditation,” and “pilates.” As a result, when a user searches for “equipment,” the ads that appear will be specifically related to Pilates, rather than to any other types of equipment. Ad location: You can optimize the location of your ads on search result pages. We recommend placing ads at the top and along the right-hand side, as we’ve found that this layout increases visibility and revenue. Are you ready to give AdSense for search a try? You can find all the information you’ll need to set up AdSense for search here, or watch the video below to learn more! Online readers have a very short attention span. You might be able to get users to your content, but what if they can’t quickly find what they’re looking for? That’s why it’s important to make sure that the users who come to your site actually stay there.